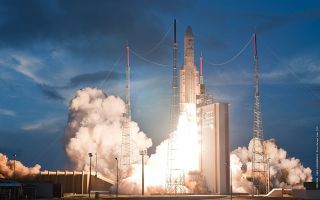 On Sept. 28, 2012 an Ariane 5 launcher lifted off from Europe’s Spaceport in French Guiana on its mission to place two telecommunications satellites, Astra-2F and GSAT-10, into their planned geostationary transfer orbits. In this cool space wallpaper, on Sept. 28, 2012 an Ariane 5 launcher lifted off from Europe’s Spaceport in French Guiana on its mission to place two telecommunications satellites, Astra-2F and GSAT-10, into their planned geostationary transfer orbits. Liftoff of flight VA209, the 65th Ariane 5 mission, came at 21:18 GMT.